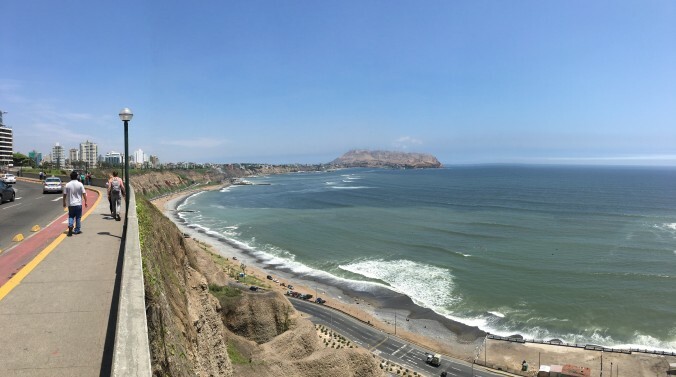 Before arriving to Lima we were put in touch with a friend of a friend who was graciously willing to show us around. He picked us up from the airport, holding a sign with my name on it and everything. He instantly became a friend of the family. His help during our time in Lima, particularly that first day, was a major contributor to how much we enjoyed our time there (and probably Peru in general). He took us to the hostel to let us get settled, then out to lunch at La Red where we enjoyed fabulous cebiche as well as other Peruvian dishes. We were introduced to rocoto- a Peruvian spicy salsa. He also helped us by taking us to the grocery mart where we were able to buy some snacks (local Peruvian snacks with his help), water, and get local SIM cards for our cell phones. He even made sure we were able to exchange our money at an exchange location (because the airport is no Bueno for exchange rates). He drove us around the different areas of Lima so we had a decent sense of where we were. We don’t speak much Spanish at all and it was really nice having someone to order us a real Peruvian meal and help us get settled. Our hostel was in Mira Flores. After Mr. Lima dropped us off Saturday night, we passed out and slept straight through until Sunday morning. The hostel served breakfast, which meant instant coffee and bread. We had some fruit from the market to supplement the breakfasts and so they got us by. We made it Mass at noon at the Mira Flores Catholic Church then Ubered it to The Suco district where we met Mr. Lima and his family (parents, siblings, aunts, uncles, cousins!) for lunch. The Arab cuisine at Tierra Santa was delicious. One thing about dining out in Peru so far, don’t be in a hurry! The service is slow and even the customers seem to savor their food and their company slowly. Lunch seems to be the main meal of the day. People eat a lot and take their time. 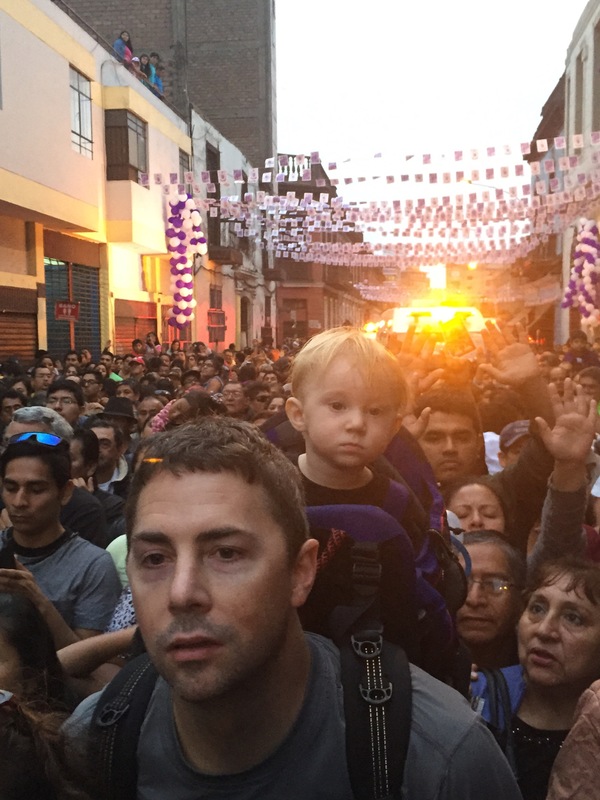 After three hours of eating lunch, now 5pm, we ordered an Uber to pick us up and take us to the center of town so I could see the precession of the lord of miracles (a local religious festival where the center of Lima is draped in purple and the church carries the saint through town for two days). Well our Uber driver tried to call is and being unable to reach us via cell he canceled our order. Again, Mr. Lima to the rescue to translate for us and make sure we were heading in the right direction! Our driver was great about getting us as close to the presecion as possible. Now the fun really began! Standing out in a sea of Peruvians, we got right in the midst of the procession. I actually think we were in it! Surrounded by locals we joined in the clapping and just moved where the crowd moved. When it was over we were right in center Lima at night fall. Street vendors galore! We bought a couple 2 sole items (roughly $0.60) and searched for what seemed like the safest food vendor. We settled on one that seemed safe enough and paid 2 soles each for dinner. Pumped up and feeling brave after being in the Peruvian crowds, we decided to keep the party going and head to Lima’s Magic Water Show. This was recommended to us by Mr. Lima’s cousin. But, not able to get an Uber, we ended up in the “wrong” part of town. A concerned older Peruvian man was able to convince us we needed to get in a Taxi. He negotiated the price of 10 soles for us and told the driver where we were going. All set. Exept the driver didn’t have change and we only had 50 soles. It took a couple attempts but eventually we made change for the taxi and we’re ready for the Magic Water Show. It was 4 soles per adult to enter the reserva park (next to the stadium), a steal! A wonderful time was had by all as we toured the many water fountains, some set to lights and music. It was a long but wonderful day in Lima. An uber took us back to the hostel and we put our passed out Little Monkey to bed at the hostel. We had the room right next to the common area so while our sweet baby slept we enjoyed a glass of wine and socialized with the other travelers. One of our favorite aspects of traveling is meeting the other travelers and generally getting to know people from all around the world. Monday in Lima bustles. We walked over 9 miles that day as we explored Mira Flores. On the way toward the water front we stopped at a playground and let Little Monkey get out some energy and socialize with other babes. We lunched at Larcomar, the upscale shopping center. Tanta restaurant was recommended by Mr. Lima, perhaps because they had menus in English and servers who spoke English too! Like good travelers, while at Larcomar, we picked up our train tickets for Machu Picchu at the Perurail point of sales. Then, we walked down to the beach and watched the surfers. We hit up the playground again on the way back to the hostel. I’ve never seen so many kids actually at the playground before. There were about 100 kids playing there this time! After a late and much needed nap, we ventured out one more time for some Chifa, the Peruvian version of Chinese food. Then, because we let Little Man eat the candied leche from the Chifa restaurant and he was fired up, the three of us socialized back at the hostel our last night in Lima (for now). You see “#LimaLove” around Lima a lot. There were definitely a lot of affectionate couples in the city. I’m not sure if that’s why, or if it’s because it’s a really great a city. Peruvians in general, so far, seem jolly. They are all happy, helpful, and kind. Maybe it’s because we are traveling with a baby. It seems more like it’s just their way though. Often, we play the what if game. “What if, we could move here for a while”. Maybe. Off toward the sacred valley and Machu Picchu next.